A review of Mobilizing Iran: Experiences of the Trans-Iranian Railway, 1850-1950, by Mikiya Koyagi. By undertaking the study of a largely neglected topic, Mikiya Koyagi has gathered an impressive array of sources that provide much insight into the social dimensions of the Trans-Iranian Railway’s construction and utilization. Koyagi begins by presenting an official account of its completion (1938), in which the father and son of the Pahlavi dynasty are the central figures. By way of contrast, his stated research interest challenges the ruler-centric perspective of this nationalist narrative, where he seeks to understand the power relations between Iran’s socio-economic strata on a local level, and, globally speaking, the country’s transnational links, including trajectories of migration (pp. 6-7). In a similar fashion, he agrees with Michel de Certeau’s criticism of Michel Foucault “for privileging producers of discipline,” and instead, he proposes that we examine how Iranian railway workers and passengers chose to interact with this new mode of transport as a “tactic” of “everyday” resistance (p. 18). Moreover, he draws upon the theories of Vincent Kaufmann, asserting that the correlation between social and spatial mobility has the potential to reveal “the seemingly unrelated impacts of the railway system on different social groups in Iran” (p. 21). As for his primary sources, Koyagi stresses that Iranian citizens’ petitions to the state have the potential to elucidate the agency of “diverse layers of the population,” much like John Chalcraft’s research within the field of Ottoman history concerning peasant disputes with state intermediaries in Egypt (p. 23). The two succeeding chapters span the years 1860 to 1927, and the first (“Penetrating Qajar Dominion”) explains why the construction of a comprehensive railway system did not come to fruition during these years in Iran. While he echoes Firuz Kazemzadeh’s view that the competing/mutual interests of Great Britain and Russia precluded the establishment of any such enterprise for most of this period, Koyagi attributes the failure of the Reuter Concession (1872) to international and domestic opposition, citing the Iranian ulama’s “fear that Europeans would come to Iran en masse,” resulting in their eventual demise (p. 40). He also enlarges the geopolitical boundaries of the classic Great Power rivalry by adopting Daniel R. Headrick’s phrase – the “tentacles of progress” – in support of his claim that “European and American officials and investors shared an understanding of the tremendous impact of railways in shaping political and economic networks of the broader region that surrounded Iran… the routes of the railways had to be carefully controlled in order not to benefit their rival empires” (p. 31). Thus, Koyagi details the construction of a limited number of frontier railway lines that served the commercial and military interests of the Anglo-Russian entente (whereby Iran had been divided into separate spheres of influence in 1907), especially during World War I. Nevertheless, this chapter ends with a brief mention of the German-American consortium that ultimately was chosen to build the Trans-Iranian Railway – and Reza Shah’s insistence on a terminus in Tehran. The third chapter (“Imagining a Trans-Iranian Railway”) focuses on how Iranians conceptualized a national railway, based on Naseri-era travelogues (safarnameh), as well as articles and illustrations from pro-modernist newspapers such as Iranshahr, Ettela‘at, and Setareh-ye Sobh. In particular, Koyagi questions the nationalist idea of a trans-Iranian railway imagined by all Iranians in the same way over the course of seventy years, a view that was propagated by official publications. Rather than a homogeneous, timeless vision of the railway, he identifies marked shifts in opinion from 1860 to 1927. For example, Hajji Mohammad Ali Pirzadeh concluded in the 1880s that railways had greatly facilitated India’s prosperity, whereas Mohammad Mosaddeq saw the specter of British imperialism in the proposed Caspian Sea-Persian Gulf rail route in the 1920s. 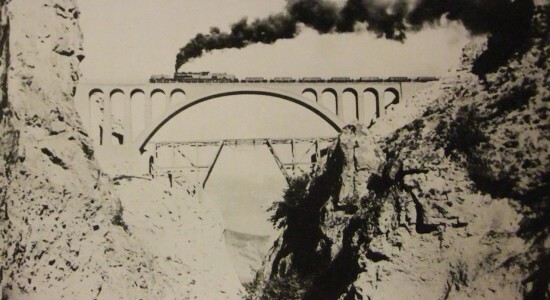 With reference to Hajji Pirzadeh’s travels, he also refutes the erroneous assumption that Iranians only derived inspiration from European railway systems during this period. For Koyagi, the interstitial lands of the Caucasus, Russia, and India were equally significant, particularly since animal-powered transport was frequently relied upon to travel through these regions to Europe. Notably, such findings stand in contrast to the newspaper cartoons from Kashkul and Setareh-ye Sobh (pp. 97 and 101), published in 1908 and 1925, which associated camels, donkeys, and their ilk with Iran’s “backwardness.” The concluding section of this chapter situates the Trans-Iranian Railway’s impending construction within the context of the Railway Act’s ratification (1927), despite the proliferation of automobiles worldwide and debates amongst Iran’s political elites. In chapter four (“Living Along the Railway Route”), Koyagi concentrates on selected areas of rural Iran that were most dramatically transformed by the railway’s construction (i.e., Lorestan, Khuzestan, the Caspian province of Mazandaran, and the site of the Tehran Station). Here, in keeping with de Certeau’s notion of “tactic,” he has elected to study how it “increased more mundane interaction between state- and quasi-state institutions and various segments of society, which could lead to dramatic moments of confrontations or to more subtle methods of redefining relations between state and society” (p. 120). For instance, he compares the disparate approaches of the Papis and the Bayranvands – both tribes in Lorestan – the first being able to secure regular employment in railway construction after agreeing to disarm and sedentarize, whereas the latter favored kidnapping in order to achieve similar aims. While the Trans-Iranian Railway’s construction could offer employment and other economic opportunities to some, its continuing expansion dislocated rice farmers in Mazandaran, who subsequently could only find work in railway construction. Similarly, the seizure of property near the site of Tehran Station incited landowners to petition the Iranian government. Koyagi also describes the agency of Iranians working for Kampsax, which was a Danish-Swedish consortium tasked with managing the railway’s construction between 1933 and 1938. In this case, “patriotic” petitions addressed a host of grievances, including a lack of financial compensation for serious workplace injuries and the favouritism accorded to Europeans, who were chosen for most managerial positions. The final chapter (“Traveling Citizens in the Railway Space”) takes up the theme of the Trans-Iranian Railway’s civilizing mission in greater detail, by considering subjective responses to its public spaces throughout the years 1925-50. Following its wider definition laid out by Andrew Light and Jonathan M. Smith, Koyagi has in mind “everything from sidewalks and parks to shopping malls, theaters, and public transportation facilities” (p. 218). He begins by juxtaposing the traveling experiences of Abu al-Hasan Ebtehaj and Najmeh Najafi, clearly showing that the latter – and no doubt many other Iranian women – responded enthusiastically to the prospect of train travel. In addition, he employs theories of identity politics, citing Michael Matthews’ scholarship on the Mexican middle class, in support of his assertion that distinct national and class identities were formed within Iran’s railway space – mainly by its modern middle-class passengers. Likewise, he finds parallels in Marian Aguiar’s characterization of Indian colonial discourse, referring to the apprehensions of Iranian modernists upon being confronted by “the display of religiosity and domesticity in the public space by the masses, which would subvert the orderliness of the space” (p. 230). In fact, he suggests that Reza Shah’s dress reform measures had little staying power after his abdication, since most railway passengers wore village or religious attire. Conversely, Koyagi refers to the travel experience of Mohammad Arjomand (formerly Reza Shah’s personal telegraphist) as evidence that the modern Iranian middle-class did not always conform to the pre-1938 ideal of “imagined European travelers” (p. 259). First and foremost, Koyagi’s dissertation represents an important contribution to ongoing research in modern Iranian historiography. In many respects, he has responded to calls for more in-depth studies of “the diverse and intertwined social, cultural, economic, and political facets of everyday life” during the Pahlavi era (Cyrus Schayegh, “Seeing Like a State: An Essay on the Historiography of Modern Iran,” International Journal of Middle East Studies 42, 2010, pp. 37–39). Further to this, the primary sources from the COWI Archives in Denmark are a welcome addition, demonstrating that there are important resources available outside the Anglo-American orbit. His findings also have provided new insights into the tensions between modernity and tradition, characteristic of twentieth-century Iran. As Koyagi himself concludes, “the Iranian railway space came to embody divisions and hierarchies of the nation. Travelers encountered different, and even competing, uses of the railway space among groups that were divided along various lines, including socioeconomic status, cultural orientation, religiosity, and ethnicity” (p. 259). In addition, his work will be of considerable interest to those wanting to expand the scope of their knowledge regarding economic and labor history of the Middle East. It will prove to be equally beneficial for anyone seeking to understand Iran’s modernization in an international context, relative to the sub-fields of global history and postcolonial studies. Koyagi’s study has been enhanced by his own personal experiences with railways, and will undoubtedly invite future research in the domain of Iranian socio-economic history, as he has intended. The University of Texas at Austin. 2015. 279 pp. Primary Advisor: Kamran Scot Aghaie. Image: By Author from the COWI Archives in Copenhagen.